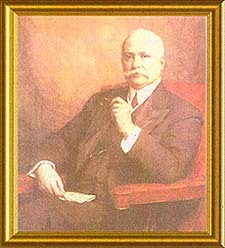 The involvement of Sir Edward Holden in the founding of Holden Lodge illustrates the direct interest the Senior Management of the Bank had in the development in the Masonic traditions represented by the “Sister Lodges”. This was still evident at the Consecration of Fortior Lodge in 1945, when, of the Founders, five held, or had held, General Manager status in the Bank. It is probably fair to say that this paternal attitude faded over the years and ended in 1982 when the mileage allowance payable to the Master, enabling him to visit the other Sister Lodges, was withdrawn and with the resignation from the Lodge of Bro. G. W. Taylor Chief Executive in 1986. W. Bro. H. L. Rouse AG. D. e.
The driving force in the mechanisation of the Bank’s accounting systems between 1927 and 1933, leading to an influx of female labour and a considerable reduction in staffing levels. He was a Joint Chief General Manager from 1946-1951. W. Bro. G. P. A. Lederer, M.e., P.G.D. Chief General Manager 1943·1946, who won his Military Cross during the 1914-18 war. He was seriously injured during the 1914·18 War, and, legend has it, he was W. Bro Lederer’s batman and received his injuries in saving his life. He was noted as a man who could make hard decisions and made his name in the Bank as Manager of Oldham Branch, when he saved the bank considerable sums during the depression of the 1930’s, when the cotton trade was on its knees. He was Chief General Manager 1951-1956 and, during this time, clashed with the Staff Association, which eventually led to its downfall. W. Bro. F. E. G. Hayward P.G.D. and Bro o. E. Wood. Became Joint General Managers in 1956 and it was during their time that the purchase of Forward Trust Ltd led the Bank into asset·finance. W. Bro Hayward wrote the history of Holden Lodge over its first 50 years. W. Bro. F. H. Griffiths. Who retired from the Bank as Manager of Newhall Street, Birmingham. He was later awarded the Order of St. John and became Provincial Grand Master of Worcestershire. A member of our sponsoring Lodge, Athol Lodge No 74. Whilst later he went through the Chair of that Lodge, he did not do so in Fortior. Very much a stalwart of the Lodge, and a guiding light to many members who followed him. He took the Chair of King Solomon in 1951 and was elevated to Grand Rank as P. J. G. D. In anticipation of our Golden Jubilee in 1995, he was acclaimed Master Elect, but unfortunately died a few days before the Installation Ceremony.